The Japanese believed that if they destroyed the American fleet in a surprise attack America would sue for peace. The attack succeeded in destroying the American battleship fleet, but Americas aircraft carriers were not in port, so while the attack was a great tactical victory for the Japanese, its result- American resolve to defeat the Japanese because of their sneak attack ( Day of Infamy) doomed the Japanese to eventual defeat. Relations between the U.S. and Japan took a turn for the worse– when the Japanese invaded China. Americans had always been sympathetic to China– with their long history of missionary work in China, combined with substantial trade relations. Even President Roosevelt remarked early in his Presidency, disclosing– how could he, with his Delano family ties (they had engaged extensively in the China trade), not be sympathetic to China? Initially, the Japanese had been successful militarily in China. Though by 1940, the Japanese seemed to be stuck in a quagmire. A new military government came to power in Japan with the twin goals of– 1) breaking the military stalemate and 2) making Japan less dependent on the United States. Over the next year, as Japan expanded southward, the United States attempted to use economic leverage over Japan. Initially, the U.S. cut off the export of high-octane aviation fuel to Japan. When the Japanese occupied Indo-China, the U.S. cut off the export of petroleum, which Japan was dependent upon. This effectively made war inevitable– unless a negotiated settlement could be reached. By the end of November it was clear no settlement could be reached. Thanks to intercepted Japanese cables, the U.S. knew that if a settlement were not reached by November 29th, events would take place that would make reaching a settlement impossible. That event was the sailing of the Japanese attack fleets. The Japanese planned to launch attacks on the Philippines, on Singapore, Malay and on additional targets– all simultaneously. The centerpiece of the plan was an audacious attack on Pearl Harbor, America’s key base in the Pacific. The goal was to catch the American fleet at anchor in a surprise attack. 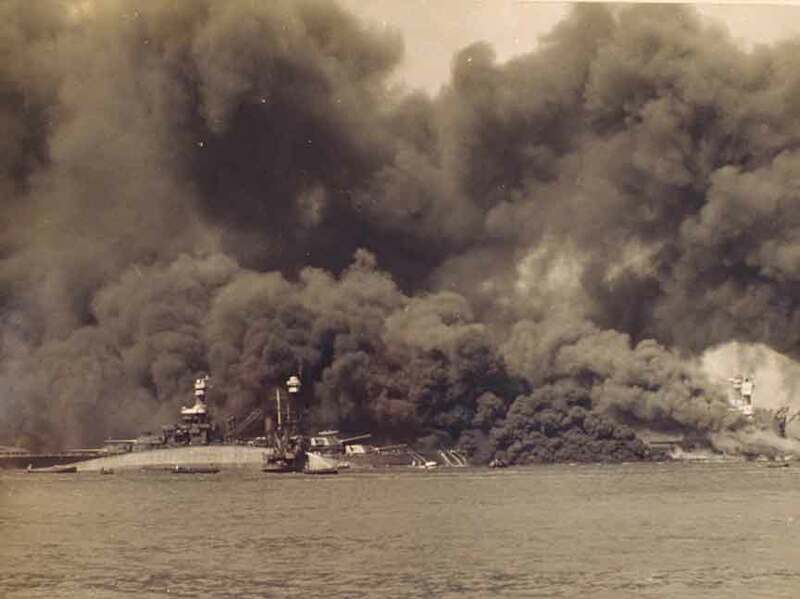 The harbor in Pearl was considered too shallow for the effective use of torpedoes. However, the Japanese had developed a torpedo that could work in shallow water. The author of the plan was Isoruku Yamamoto, Commander of the Imperial Navy. Yamamoto who had studied at Harvard, and been the Japanese Naval attaché in Washington was opposed war with America. The Japanese Naval Commander believed that although Japan would have some initial victories, it could never overcome America’s industrial might. Despite his misgivings, Yamamoto planned a campaign that would give the Japanese the best possible chance– by delivering a knock-out blow that would cripple the U.S. fleet. Six Japanese carriers, under the command of Vice Admiral Chuichi Nagumo sailed towards Hawaii. At 6:10 AM the Japanese Carriers launched their planes-–183 fighters, bombers, dive-bombers and torpedo planes headed of Oahu and Pearl Harbor. An hour later, the second wave was launched. In total, 350 planes headed toward the Island. Despite receiving warnings from Washington on the possibility of war, the U.S. forces made no special preparations in Hawaii. The U.S. Navy assumed that the Army was responsible, and the Army, was sure that the Navy was in charge. In addition, no one thought that the Japanese would actually attack Pearl. As a result, not all the radar stations on the island were manned. The planes at the airbases were lined up like they were on parade, and the battleships of the Navy were all neatly moored on Battleship row. All that made the U.S. forces an easy target for the Japanese. The battleship U.S.S. Arizona was sunk almost instantly, when a bomb exploded to the forward magazine. Sinking of the Arizona entombed 1,103 American sailors, for all time. An additional 17 ship were either crippled or sunk. A total of 2,403 servicemen lost their lives. 175 U.S. aircraft were destroyed. Luckily for the Americans, the U.S. Carriers were out to sea during the attack. The Japanese decided to call off the attack after the second wave, sparing the critical fuel storage tanks and repair facilities at Pearl Harbor. President Roosevelt was notified at 1:40 PM of the Japanese attack. By 3 PM he was meeting with his advisors taking whatever actions he deemed necessary. The next day, following a cabinet meeting that evening, F.D.R. went before Congress and asked for a Declaration of War against Japan.